Not many people have seen this. These three words sum it all up. It's a unique idea. The wallpaper serves to leave us with the mysterious and magical feeling. The leaves have been well-drawn and the sparkles have not been over-used. A very nice wallpaper overall. Proposed by bromithia and highlighted by euna. Nice and mysterious concept. The outcome is truly beautiful... keep up the great work. hard to say what i think. Perhaps the stars could have been better. It's very repetitive. I suggest you try using size jitter. It will stop the stars looking so repetitive. ooohhh... i know that! It's from Howl's Moving Castle! This really goes well with my present mood. I'm sticking this in the background. i like it . it kina reminds me of when you wave those sparkers around , mut it realy mysterious. cool . because my web broswer didnt finished loading the lower part yet. thanx for sharing your great work! 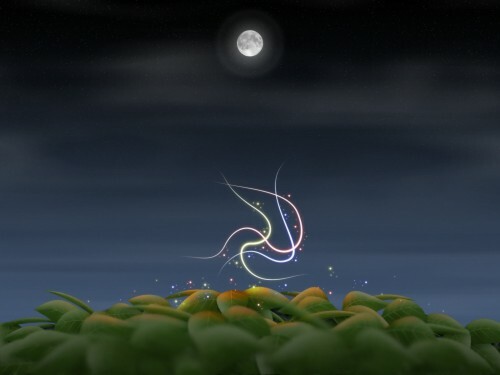 Very beautiful wallpaper... kind of reminds me of lightning bugs on a summer night.